Recreate your favourite Marvel Avengers or DC heroes with awesome Halloween costume ideas at supernatural deals from Walmart.ca – Easy, DIY cosplay! It’s that time again—to pull showstopper costumes out of thin air. Walmart and superheroes come to your rescue with surprisingly easy, and affordable, Halloween costume ideas. Not only do superhero costumes offer you and your little ones the chance to act out your favourite leading men and women, but they can also often be made with things you’re likely to find around your home and at your local Walmart! Whether it’s Wonder Woman in full armour, or a DIY spin on Spiderman that lets you show off your artistic skills, these Halloween costumes for adults and kids will help showcase the hero in you. It’s a bird! It’s a plane! It’s a DIY superhero! This comic classic is easy to pull off at home. All you need is a blue outfit (shirt, long johns or pajamas will do) and a red cape (or blanket). Bonus points for red underwear or shorts worn overtop. You can sketch out an S for Superman (or Supergirl) on the chest using masking tape, or go the distance with a red felt cutout. And if you really want to stand out (dads, we’re looking at you), wear the ensemble beneath a white button down and black trousers with glasses to hint at Super’s alter ego, Clark Kent, mid-costume change. For girls, a red skirt, stockings and shiny belt round out Supergirl’s look. Let your craft ing skills shine with a DIY Captain America costume! Grab anything blue and use coloured masking tape to do the rest. To create Captain America’s signature mask, just grab a sheet of blue craft paper or felt and twine, cut out holes and size to fit. A blue toque with an A taped on tops it all off. You can purchase the Captain America shield (it doubles as a fun toy for your little one), or craft your own using a Frisbee, craft paper or felt, glue and masking tape. Watch the evildoers scatter! Long brown locks and a flowing red cape are the key to this look. The rest is easy enough to customize. A red bathing suit is ideal, but a red tank top will do just as well, combined with a blue skirt or shorts. Now we get to the fun part: recreating the superhero’s bling. Wrist cuffs can be made from toilet paper rolls and tinfoil, which also brings out the shine in any wardrobe belt. Foil and cardboard help to make Wonder Woman’s statement tiara too. Of course, the real deal is also readily available, if you’re looking for something with staying power. Or you can keep your look homegrown, and add a jump rope lasso or store-bought Dawn of Justice sword to your repertoire—no doubt it’ll come in handy next Halloween! Batman sure is one easy Halloween costume to recreate at home. Black shirt and pants or tights will do the trick, along with black shoes, gloves and a shiny belt. Now all you need is the elusive one’s cape and mask. Here’s where you can take some creative licence. Boys might want a hardcover option they can wear time and time again. While girls can have some fun with purple glitter to create a shimmery Batgirl illusion! Spiderman is a Halloween costume favourite, for all ages. This costume, however, can be a little more complex to DIY than your average superhero. Start with a red shirt and blue tights, and red socks you can wear over shoes. Use black marker to trace out a web design and trademark spider on top. (Black puffy paint creates a nice effect.) You can purchase Spidey’s mask from your local Walmart, or use felt to design your own. With his bulging muscles and luscious blond hair, Thor is a fun hero to dress up as for kids and adults alike. To recreate the look at home, check your closets for a grey shirt and black pants. Then grab a red cape for a fresh outing. A blond wig makes this Halloween costume instantly recognizable, while a hammer ensures your hero is ready for a fight! This Halloween costume for adults is a sure fire party winner. It’s a pretty intricate costume to pull off at home though. Super fans can find out how to create their very own Deadpool costume from scratch with this detailed video tutorial from CineFix, or you can pick up some essentials from your local Walmart for some quick, easy shortcuts. First, you’ll need a red long sleeve shirt, red leggings and black boots and gloves. Next, the costume calls for not one but two ninja swords. Finally, black tape helps pull off the finishing touches. A Deadpool mask promises to be a dead giveaway, or you can try a DIY approach using a red balaclava and black makeup around your eyes. With Avengers: Infinity War still leaving fans reeling, Black Widow is one hot topic this Halloween. Moms can bring her to life with a red wig, tight-fitting black leather jacket or long-sleeve and black skinny jeans. Turn the costume into a superhero duo by getting dad to join in as any one of Black Widow’s admirers. Will it be The Hulk? Hawkeye? Daredevil? You decide. A superhero ensemble makes for fun for the whole family. While moms and dads and their little ones can easily recreate the Avengers, another group of superheroes is making its way from the screen to homes around your neighbourhood: Mr. 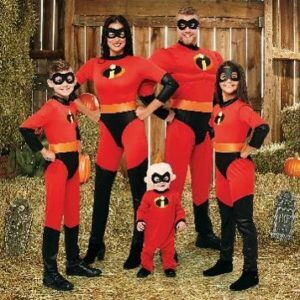 Incredible and Elasti-girl, Dash, Violet and baby Jack of the popular film The Incredibles. For this one, everyone in your gang will need to be dressed in head-to-toe red. Black capes and masks round out the look. (If you have an old black t-shirt, you can cut it into five long strips and cut out holes for eyes for matching masks.) Go team!